Chief Olabode GeorgeWhen things happen in our own unique Nigerian way, you find yourself doing a systematic check on yourself just to be sure that the fault is not from you. What has happened is of course absolutely crazy and you’ve got to be sure that it is the occurrence and the people who orchestrated it that are crazy and not you. This has become such an impulsive ritual that even when Bode George got his Nigerian Sentence during the week I had to do a massive check with myself and fellow Nigerians to be confirm that it wasn’t me that had gone crazy. And even as I write I pray earnestly that at worst the ridiculous sentence is for real because it’s highly possible that in the books Bode George is an inmate at the Ikoyi prison while indeed he’s somewhere in Europe living large and garish. Or to make it a little real he could decide to live at home in the island and sneak into prison at dawn so that amebos can see, hangout with the wardens in the cozy parts of the prison and sneak out again at night. While we may not be able to reverse the sentence and give him what he truly deserves for being such a brazen fraudster, we can only hope that the little he gets goes to him. Thus, in as much I oppose oppression of any kind, I’ll break my own rules and hope that Bode George and his accomplices get to go through the initiation rites other convicts go through during their early days in prison; the beatings and bullying that others go through on arrival. Don’t ask me how I got to know about the prison rituals I lived it many times in Jos Prison as an official of the University of Jos when the National Association of Nigerian Students was worth the name attached to it. And I know about the SSS detention centre in Shaginsha Lagos, I have been a guest of the SSS underground cell in the middle of nowhere on the outs skirts of Abuja. I have had a taste of several police detentions. I am so proud of the trauma as they testify to a sacrifice we have have to make for our nations. But I feel pain that Swagger man Bode will not see the prison we saw, he will never partake in the ritual of a new comer. He will be in a “special cell” in Jos Prison it is known as “B ward” Bode’s alter ego Olusegun Obasonjo spent some months in that cosy cell. I onlyt could admire it as I stroll around the yard of the colonial Jos prison in those days. I feel sad. The big mans cell in Nigeria is home away from home. Uncle swagger Bode will be laughing at us all. The common man steal bread in Idumota market, we shout “Ole! Ole! Ole! And get him a “necklace” (used tire) we get petrol and roast him alive. 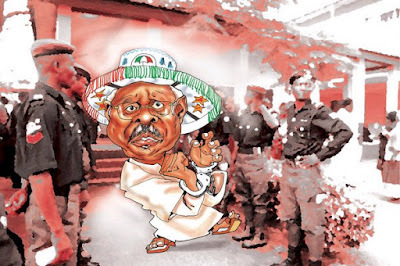 Powerful men like Bode George Is to spend 913 days for stealing N84bn at the rate of N92m per day. Nigeria ! One country ! One law for the mighty another for the less priviledge. What an outrage but then “half justice” is better than none, at least we can call him Olabode George. GCOFIPN (Grand Convict of the Federal Ikoyi Prison of Nigeria). Kudos to the brave judge.Olabode George is a key player in the destruction of our country and a mastermind behind the misrule that now creates most of the criminals we have in prison today. That’s why it is only right that he gets a taste of his own medicine. For years men like Bode George have maintained their stranglehold on the nation; wheeling and dealing, unleashing terror on the people like predators on the prowl in some lawless jungle. Even predators in the jungle live by their rules. They are not wasteful. They don’t kill what they don’t need! Terror is a violation that not only aggrieved groups or persons are capable of committing against a others; leaders like the thieving manipulating George, irresponsible Yar’adua, con Ibori, and their ilk before them do rain terror on Nigerians killing them with poverty, lack of adequate health care and the basic necessities of life that any good government must provide for the people. The EFCC must give us reasons to believe that this is indeed a conviction in spite of its deficiency and not just another smart way of kicking dirt into our eyes. Our politicians and their cronies in government are deft at insulting our intelligence and getting away with it while we sit back grateful for the charade they just acted before us. Isn’t it possible that this conviction is just a decoy that’s supposed to appease us while an even greater evil is being done somewhere? The burden of survival is depleting our sense of history and we quickly forgive and forget because we’ve got no mental/moral energy left to fight. The EFCC must prove to Nigerians that this gawky victory is not a ransom for others awaiting trial and definite conviction. We must be able to see the way forward in all this; yes they go to prison but what about the money they got through the scam? Will the money be recovered? How will it be recovered? What is being done to recover it? While we will try and encourage ourselves to get over the fact that a man gets a two and a half year sentence for fraud that’s worth billions of naira it is important those who by fraud or by merit now find themselves at the helm of affairs in our great country to realize the fact that Nigerians are waking up! Waking up to the call for complete change in the way our great country is managed. People will be held accountable for their deeds; even after they are dead and gone! As the tears of suffering Nigerians whose lives they cut short to enrich theirs fall on the ground, even the dust they must return to will war against them! Killing our citizens softly! The primary healthcare mess in Nigeria. Professor Babatunde Osotimehin is Nigeria’s Minister of Health, I don’t know the schedule of the minister but I have a humble suggestion for him, the professor should take time off his very busy schedule of addressing international forums and visit some of the rural areas in Nigeria and see for himself the gory details of what happens when a government abandons its people. One of the legacies of the ministers in the Umaru Musa Yar'Adua government in Nigeria is the length of time they spend outside Nigeria. Thus it is no longer unusual to walk along major European cities and meet Nigerian ministers conducting everything but the affairs of state. Their seeming lack of knowledge and understanding of what is going on in the nook and crannies of the country means the difficulty in their different ministries look ordinary and nothing unusual to them and their advisers. I have listened to Nigeria’s minister of health PROFESSOR Babatunde Osotimehin. He is a frequent visitor to the United Kingdom and loves international forums. And it is quite commendable to see our minister “network” with the who is who in the international community; I would have been hoodwinked by the smooth talking professor, the professor earlier in the year called on Nigerian physicians in the Diaspora to return home and showcase their talents he particularly challenged Nigerian medical practitioners in the United States of America to “return home” I completely agree with the minister that all citizens should in one way or the other volunteer time and resources to develop the country but the minister should show a good example and take the lead. He should start by doing something worthwhile to encourage Nigerians in Diaspora. I accompanied some German based Nigerian medical team to Nigeria in august of 2009. Private citizens who visit the country unnoticed, to help out in the hinterland and communities that appear to have been wiped out of the map of Nigeria by the Nigerian government. The professor should please take time off and visit the following health facilities; I have seen them and they are a painful travesty of what primary health care delivery should be. In Kano state we visited health facilities in Waraw, Tsanyawa and Bagwai, Birnin Magaji in Zamfara, Ibeju Lekki in Lagos, Nkpor in Anambra state and Ikare in Ondo State Nigeria and these health centres are junky medical showrooms visited by people who have no alternatives, knowing that they even lack the resources to go to bigger neighborhoods’ where they can find private hospitals that are well above their range financially. I am not a medical expert but you do not have to be a professor of medicine, or a practicing medical expert to notice the presence of anything but functional healthcare facilities at the most important level of healthcare delivery in our country. 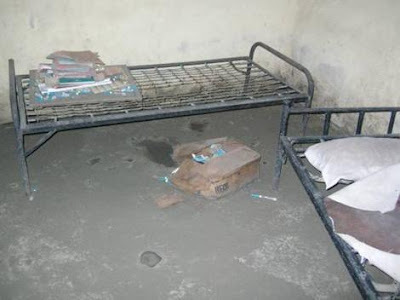 Primary health care delivery in some cases is offered in dilapidated buildings, and in other cases very well built fancy structures that are cursed with the absence of skilled health workers, functional equipments and grouchy poorly motivated health workers. At the level of these communities, the poor level of awareness of the importance of healthy living is as a result of inability of health workers to provide health education to the people. The federal government has of course dumped the responsibility of health education on the shoulders of international aid agencies. Furthermore, the result of World Bank policy is the decision to replace the provision of drugs with the national health insurance which is available only to civil servants who form about 10% of the total population of Nigerians while the local governments who are meant to provide drugs are stretched to the limits. Besides massive corruption drains funds meant for primary health care delivery and never mind the government’s promise to raise the total budget for health to 15% of; Nigerians could survive a bit if the current allocation was spent on them. I am hoping that by the minister would read this, and resolve to give primary health care the required attention. Relying on the opinion of sundry consultants in the assessment of our current health situation and the performance of the ministry of Health is irresponsible. The minister should knuckle down and get involved in what is happening in his ministry. He should personally know whether Nigerians can get attention when they need it. He should know whether the health centres and hospitals have the technical and human capacity to provide this attention. He should know what it takes to replace the travesty we call health care delivery with a system that is empowered in all ramifications to work. The National Primary Health Care Development Agency (NPHCDA), was established in 1992 with the main aim of ensuring sustainable primary health care in all noon and crannies of the Nigerian federation, Mr Minister your agency is as of today not fit for purpose, beyond the regular radio jingle and the millions of naira dolled on media houses and spin doctors, the NPHCDA should connect to ordinary Nigerian’s. Beyond rhetoric, Nigerian health practitioners home and abroad should rise up and confront the orchestrated deficiencies that are killing our people all over the country. Some of those in the Diaspora come in trickles with their colleagues to provide free medical services where it is badly needed. May God empower more of them to do same. These volunteer could become foreign legions that will visit the rural health centres and provide time and facilities. It bears re-emphasising that we must make the health ministry more accountable. To make matters worse, we have that fraud called interventions by the United Nations Development Fund; in Ikare for instance where three different health centres are reported to have been built for the community, I was terribly shocked and disappointed. Between the United Nations and their local partners some one must take responsibility for the lie that’s called a health centre. Our inability to make our government accountable is giving those in office the courage to do whatever they want to do and more painful is the fact that those in the rural community have little or no voice. No avenue to cry out. If we continue to define our “development” on the bases of the number of sky scrappers and 10 lane roads coming up in Lagos and Abuja. Or the number of international forums our minister’s attend or the laughable statistics we exhibit out on daily basis to a gullible section of the local and international media, then we are more or less a nation with a greater percentage of unwell population. It is dreadful enough that we cannot provide our people with a the basic needs in life , even as basic as clean water, accessible road network, corrupt free institutions, a lasting and transparent electoral process, at least we should not burden our local communities with slow death, that farmer in Northern Nigeria should not have to worry about treating a snake bite, the Niger Delta woman in the riverside area should be able to seek advice from a health care assistance close to the river bank. The Ibeju Lekki bus conductor should have a place to go to effortlessly for health advice. Ordinary Nigerians do not ask for more, they see local schools become glorified poultries, open greeneries that used to be the meeting points for youths to interact are taken over by uncaring elite and primary health care is now added to the list of “hard to find hard to get”. 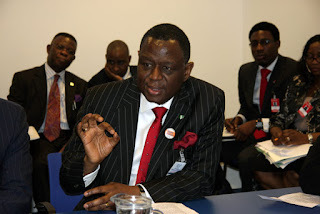 London “Kpeke” life and the Nigerian High Commission in the United Kingdom. The life of the Nigerian is a very complicated one; somehow the evil we are challenged with at home seems to follow us everywhere we go. As life at home increasingly became a grind and the massive brain-drain syndrome depleted the ranks of our professionals, the expectation was that hell was being left behind and the destination abroad was paradise. Whereas for some this is true, for a lot of Nigerians, this highly besought paradise is becoming another hell hole. Nigerians in the United Kingdom are reported to be topping a million or more and are said to be the “fastest growing ethnic minority group in the United Kingdom”. It is common these days to meet a larger segment of the Nigerian community describing themselves as “Nigerian British “ a catch phrase for identifying Nigerians with British nationality or as some would put it British people of Nigerian descent. Of course they sure have dissolved themselves into the British society and now we easily refer to Seal, Sade Adu, Chiwetel Ejiofor, Sophie Okonedo, Lemar the soul singer and other’s as British acts even though the Nigerian blood flows deep in them. Slave trade and colonialism consolidated the British Nigerian link, with London being the “host city” to Nigerians; the British home office describes London as the home of the largest Nigerian communities and possibly the largest oversees Nigerian communities in the world outside Nigeria. I call them Nigerian communities because we have taken tribalism with us and so within the broad Nigerian community you have cultural and even social groups that segregate. The South London town of Peckham is the home of the largest overseas Nigerian community in the world. Yoruba the language of ethnic Yoruba people in South West Nigeria is widely spoken in London in particular the Southern London Boroughs’. Name any Nigerian food and you can get it in a jiffy and in abundance, either from the Dalston market, Peckham market, Finsbury Park and the many Nigerian shops springing up in every nook and crannies of the city of London. Nigerian clubs and food restaurants are on the rise and it is noteworthy that Nigerians are reported to own the highest number of African restaurants in the United Kingdom with the city of London accounting for majority of the eateries. In spite of these economic activities, It cannot be said to be all rosy for the Nigerian community in the UK as the numerical advantage they have as not been translated into a political force. Nigerians until recently are not known to be united when it comes to issues affecting the home land. However, we anticipate gradual attitudinal changes as groups are now networking; the advent of social network sites such as face book, twitter, bego and others are increasingly facilitating the capacity of various groups to network. We’ve got a long way to go though in comparison with the influence wielded by the Somali or Ghanaian community. The Nigerian High commission in Northumberland is just less than 5 minutes walk from the famous tourist site, Trafalgar square, but the high commission is never a place Nigerians look forward to visiting for any kind of business. Even though the old rug at the reception area has been replaced with a more presentable one the disposition and efficiency of the staff of the high commission is a far cry from what it should be. When Nigerians encounter problems here in the United Kingdom, the high commission is the last place they want to go to as officials will never respond to enquiries or call for help. Instances abound, chronicling the indifference of the high commission to the plight of Nigerians. 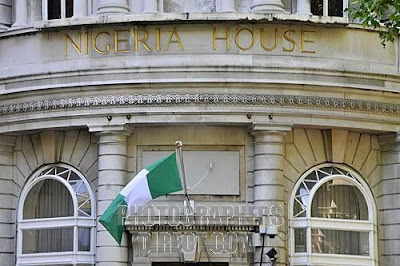 The customary joke that goes around is that if you want to have a feel of how things work in Nigeria just visit the Nigerian high commission in London; bureaucratic bottlenecks, extortions, delay in issuance of travel documents, the list goes on. Ironically the high commission is quite efficient when it comes to issuing visas to foreign nationals visiting Nigeria. In fact, the high commission is commonly referred to by Nigerians as the “western union” arm of the thieving Nigerian ruling elite, with allegations that the embassy is being used as a cover to transfer stolen money from Nigeria into the United Kingdom. It’s stunning to see how diplomatic staff spend valuable time running errands for visiting Nigerian officials even when in most cases their visits are private. Little time is spent addressing the needs of ordinary Nigerians. Nigerian are a huge percentage of inmates her majesty’s prison; Holloway prison is filled with Nigerian women some who are mainly victims of circumstances and others who are slammed in for drugs, fraud, cyber crime or immigrations problems. The high commission does not have a case worker who visits these prisons as it is done by other embassies in the United Kingdom. It is never the business of the High commission; even in clear cases where Nigerians are victims of miscarriage of justice ,no help is forthcoming. To get the bills paid and put food on the table, Nigerians have now established the “Kpeke” business. “kpeke” is a coinage from the sound a coin makes when you drop it in a bowl and that is the term some Nigerians use to describe the job of toilet assistants in night clubs. The rise in the number of Nigerians who have no alternative and now make a living as toilet assistants in the UK is alarming. The job is so humiliating that the attendant is subjected to between seven to eight hours in the toilet without formal pay. The reward for cleaning the toilet is expected to come from the coin dropped “kpeke” in a bowl. So the sound of each coin brings a reassuring smile to the attendant. Now because tipping is not obligatory some may just spend a whole night with little or no money to take them home. That our citizen have to resort to this way of life is an indictment on the way we have mismanaged our country turning able bodied and very well educated men and women into toilet attendants in European cities. Add to this the provocation of watching politicians and public office holders who come in and out of the United Kingdom and spend money like crazy. Nigerians in the United Kingdom see family members of Nigerian public office holders’ ride expensive cars that even British citizens only see with mouth agape in advertisements. They open glossy Nigerian magazines and see how fellow Nigerians boast of millions they have not earned, stolen wealth! Sadly, rather than get angry they pray to God to be able to join them and if they fail to join them, they pray that someday their children would rise and be like those who enslave them. They flock the ever increasing Nigerian churches springing up in every nook and crannies of inner London boroughs’. It’s a shame that Nigerians rarely get effectively angry in the United Kingdom; we moan about the situation of things at home, rain curses on the President of Nigeria Umoru Musa Yar’adua, his godfather James Ibori and other’s and then ask for when the next party will be taking place in Peckham or when the next Nigerian artist is coming to throw a big concert. We then gather our earnings from, the “kpeke” business, thank God for his mercies, put on our best attire from Primax or M&S and move to the party and dance like we’ve got no worries because tomorrow will never come. Then, non Nigerians will look at us, shake their heads and retort “Nigerians, they deserve the kind of government they have”. Photo Speak! My Nigeria the Beautiful! In august 2009 I did visit my Country of birth Nigeria and I took some random pictures i and could not help but share random image of that beautiful country with you. Enjoy. We may be maltreated by Government but we send our children to School. "Trafiki Light we dey Obey"
Abuja Blues the "Moon and the Rock". Sunset On Lagos 3rd mainland bridge. Ikare the Root. Main aproach to Ikare Town.